I love using hummus as the base for pizza as an alternative to the tomato based pizzas I usually eat. It gives the pizza a wonderful flavor and adds a creamy texture so you do not need to add cheese if you do not want or cannot tolerate it. The dough is taken from Shauna Ahern of Gluten-Free Girl and the Chef*. I love the texture, the taste, and it is easy to make. A bonus is that my husband who is not wheat-free also loves it so I only have to make one dough, not two. I hope you like this as much as we do. Bon Appetit! My mix is 400 grams of brown rice or oat flour, 300 grams of arrowroot flour, and 300 grams of potato starch. You can learn more about Shauna’s flour mix here. I get this from Trader Joes’s but if you cannot find it, Shauna Ahern recommends one teaspoon of freshly ground chia seeds instead. Mix together the flour mix, yeast, psyllium husk, and salt in a stand mixer. Set the mixer on low and add the olive oil, the egg, and then slowly add the water. Note from Shauna Ahern: Gluten-free pizza dough will not look the same as gluten dough. It will be far wetter, even a little like pancake batter. As you pour the water, look for the dough to come together around the paddle. However, when your turn off the mixer, the dough should slump off the paddle immediately. Transfer the dough into a greased bowl (I use cooking spray), cover it with plastic wrap, and let sit for about an hour and a half in a warm spot. Expect the dough to rise, but not as much as gluten dough. About fifteen minutes before the dough is done rising, prepare the swiss chard. Add the olive oil to a sauté pan over a medium-high heat. Add chopped swiss chard and sauté until it is wilted, about 3 minutes. Add the red wine vinegar and when combined turn off heat. Set aside to prepare the dough. Depending on the size of pizza you want, you can either cook the whole dough or cut it in half and freeze the rest for another time (up to 3 months). For two people, I use half the dough. Transfer the dough onto a greased cookie sheet. I lay tinfoil on the cookie sheet and use cooking spray for an easy cleanup. Roll out the dough to desired thickness/thinness. I like it thin. Spread the hummus across the pizza dough. I like a thin layer of the hummus but you can add more, depending on your preference. Add one layer of the sliced radishes to the hummus. 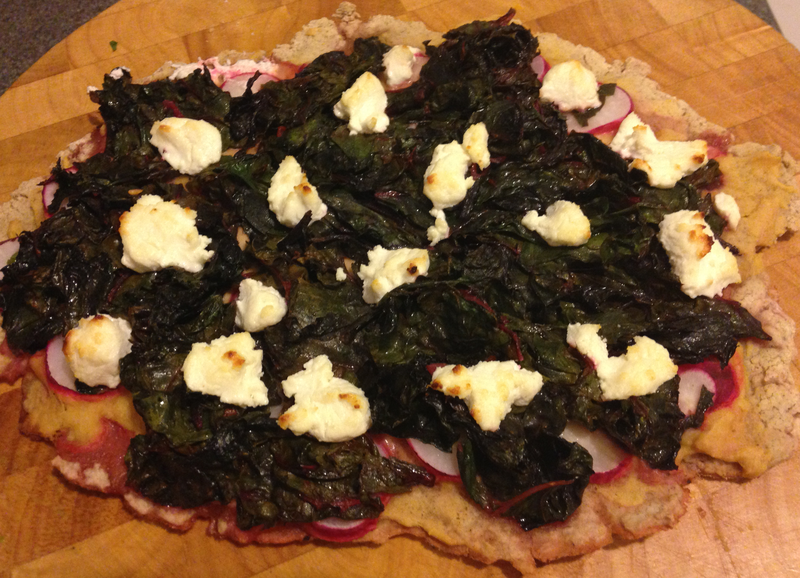 Spread the swiss chard mixture over the pizza dough. Add the goat cheese (optional). Bake the pizza in a 425 degree preheated oven for about 12 minutes. The crust and the goat cheese should be slightly brown. *I bake my pizza dough differently than Shauna Ahern. If you want her complete recipe, you can visit the Food Network. **Hummus is not safe for the low FODMAP elimination diet. Looks/sounds great 🙂 like the use of hummus for those that can tolerate – a nice twist! Thanks. I was looking for an alternative to pasta sauce since too many tomatoes can aggravate my stomach and in general can lead to inflammation. I can manage a small serving of hummus but do need to eat this on a good stomach day.